Kids, teens and adults are more inspired to tinker after they learn the basic framework of what they are tinkering with. Electronics and circuit sets are great, but it really helps to jump-start learning with demos or projects that are heavily documented in the box. After you get your bearings on what works and what breaks, you are more free to experiment and add your own ideas. 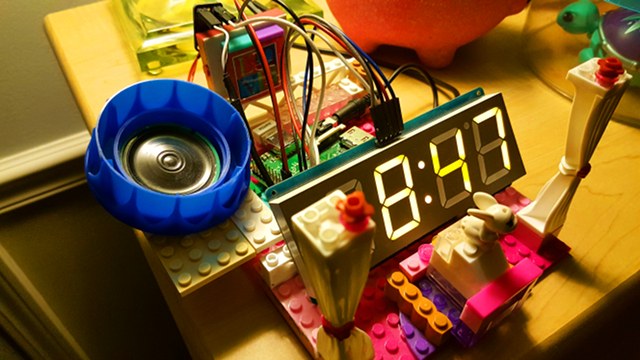 In that spirit, I am working on a hackable alarm clock based on the Raspberry Pi platform along with several Adafruit/Sparkfun components. The idea is that we can build a customized, tricked-out bedroom alarm clock with some general off-the-shelf components to see how hardware and software work in concert to create something useful. After the project is done, I'm hoping its creators will feel inspired to rip it apart or build new features using the pieces. Build details for instructors are available at the HackADay Project Page. This provides a parts list as well as an overview of build instructions. Source code is available on the hack-clock GitHub page. The source code for the lesson plans are available in the directory hack-clock/lessons/. Fritzing diagrams are available to demonstrate component wiring and GPIO boards. The text of these original instructions, lessons and how-to guides are licensed under a Creative Commons Attribution-NonCommercial-ShareAlike 4.0 International License. Original source and licensing for images are listed within /images/LICENSE.